A man who kept two dogs that ferociously attacked a mother has been jailed for two and a half years. 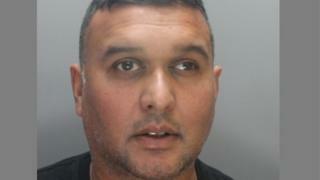 Nijamul Islam, 44, of Farm Road, Edgware, north London, pleaded guilty to two charges of being in charge of a dog, dangerously out of control. Beata Obuchowski was working as a kennel maid when she was savaged by a Belgian Shepherd dog and a German Shepherd dog for about half an hour. Islam's dogs attacked her on a deserted farm in Hertfordshire in 2014. The farm was being used to train guard dogs and the court was told that for between 30 to 40 minutes, Polish mother-of-one Ms Obuchowski found herself under attack from the animals. She was repeatedly bitten about her hands, arms and legs. In the end, as the dogs began to tire, Ms Obuchowski - armed with a stone she had picked up to defend herself - pretended to be dead and lay lifeless on the ground. The court was told her injuries were so severe that she remained in hospital for two and a half months following the attack. Her right middle finger had to be amputated at the knuckle and the right index finger had to be amputated below the fingernail. Following the attack, police found 99 animals were being kept at the farm in Great Amwell, near Ware. Jurors heard Islam kept the dogs in horrendous conditions and a vet who attended the scene for the RSPCA was shocked by what she found. Forty of the dogs had to be put down including the dogs that had attacked Ms Obuchowski. Islam's barrister, Mr Joe Sidhu QC, asked that he be given credit for his guilty pleas on the day of his trial.